Hey friends! 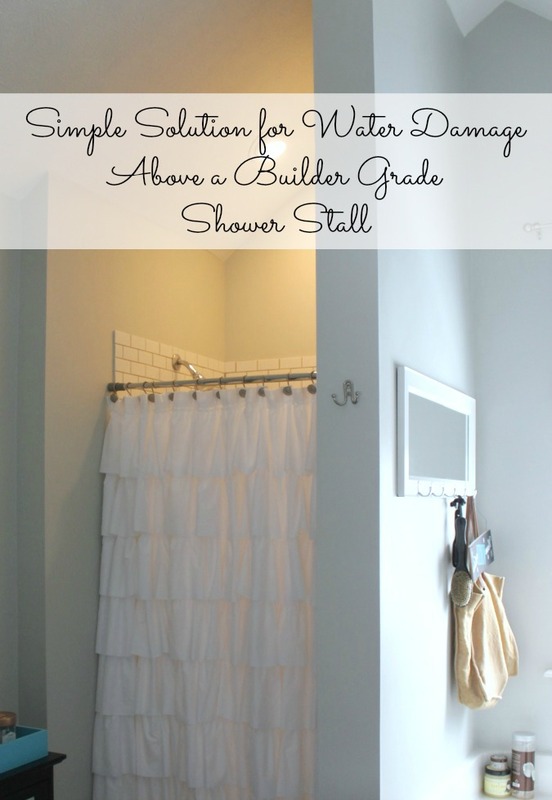 I am so excited today to share with you some major progress we have made in our master bathroom! 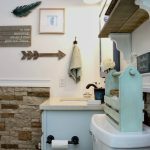 I finally finished the DIY subway tile backsplash that I have been working on, and you may have seen me mention it here and there. Let me say now that this post is a reveal of my tile backsplash, but in no way is this a tutorial. This was only my second (and largest) tile job, so in no way do I feel in any position to tell you how to do it. I am, however, very happy with the way it turned out, and this particular project was a big transformation in this room! I have lots of pictures to share with you today of the evolution of this room and where is is right now, and along the way I’ll also tell the story of the transformation. This room is only a couple of projects away from being complete! Before we get started with this post today, I just want to say it is the second time I have had to write this post. I spent several hours putting this post together over the weekend, and when I was finally finished and went to publish it, I lost it forever. I won’t bore you with the details, but my original post was gone, and I was left just sitting there staring at the computer screen and trying to absorb the fact that all of my work was lost. And just so you know, it was totally fabulous, and witty, and cool. So I will try my best to rewrite it and have it be equally as good, but I must admit, not fun at all! This is the bathroom shortly after we moved into the house. The walls were a cucumber green when we moved in. I didn’t mind the color, but it cast a greenish glow on everything. I was not thrilled with the look of this room, but I thought it had great bones, and I knew that I could make it into a room that we loved. It has really tall ceilings, and the room is spacious. I pretty much just brought everything from our bathroom in our old house and plopped it down, and I bought the black cabinet to use for some extra storage. So at this point, I had not changed anything. This is the room how it looks today. I think it is an amazing transformation! We needed to transform this room on a pretty tight budget, so there have been no major gut jobs. We just wanted to work with what already existed and make it better. For this tile job, I bought a manual tile cutter, nothing fancy, and you can only cut straight lines with it. I would not say that my tile job is the work of a professional, but I think I did a pretty good job for a beginner, and I learned a lot along the way! If you look at the reflection of the shower stall in the mirror, you can see that I I also installed the same tile over the shower stall to protect the walls from water damage. You can read all about that project what product I used to hang the tile, and the grout color I used by clicking here. 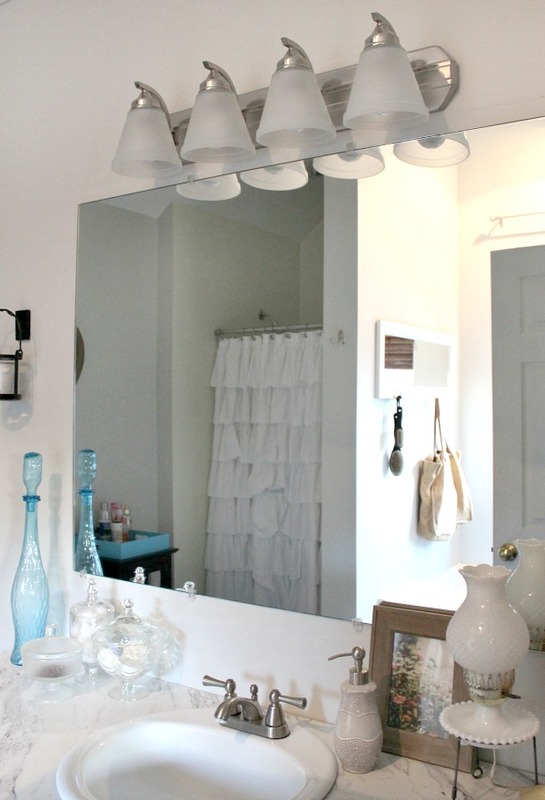 I hung that ruffled shower curtain that I found at Homegoods almost two years ago, and I’m still loving it today! In this picture, you can see the shower stall before we painted and tiled it. 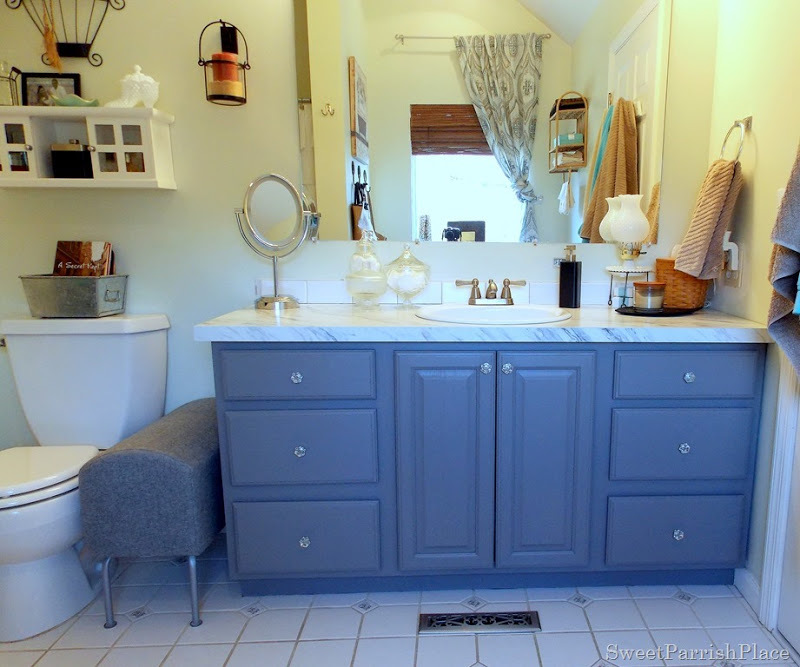 We had painted all of the other walls in the color grey owl by Benjamin Moore, except for the shower stall. 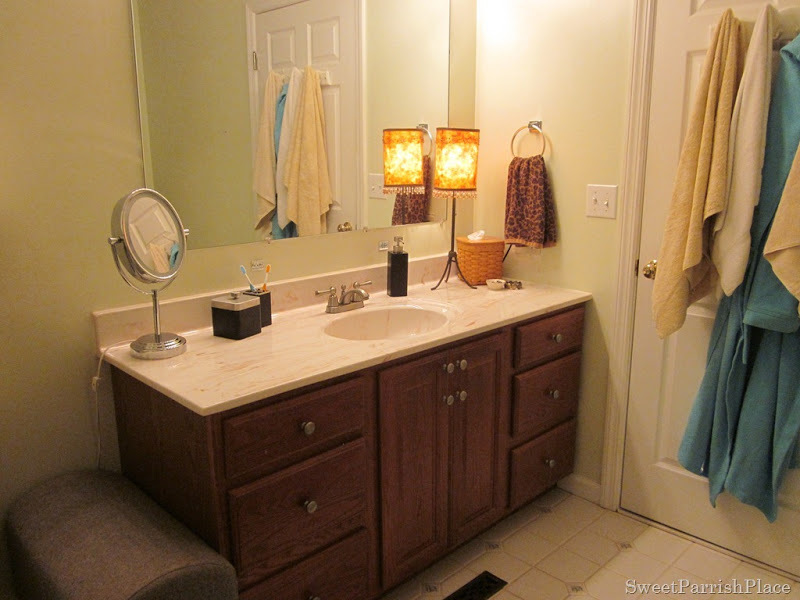 We also changed out the light over the sink, which I just realized when writing this post, I have not written a post about switching out the light yet, so I need to do that. It is much easier than you might think! Here is what the light looks like turned on. I chose this light because it has a brushed nickel finish, I like the white globes, and I like the clean and simple lines of it. Plus, it was easy on the budget. We had to remove it while we tiled this wall, and we had a lot of trouble getting hung back up afterward. Rehanging this light fixture was probably the most difficult part of the whole project. We were both frustrated and getting short with each other, and I ended up having to make a trip to Home Depot for longer screws. But we finally got it hung, and we are both happy with the result, so it all worked out in the end. The first thing I changed in this room was to replace the sink and counter top. We chose this laminate counter by WilsonArt in calcutta marble– and we are very happy with this selection! It looks so much like real marble, and we chose just a basic white round sink and we kept the faucet we already had because it had recently been replaced by the old owners. This is a good picture to help me explain why I chose to hang the tile in this pattern. If you recall, I was using a manual tile cutter. I decided to hang the tile on either side vertically because it was going to mean less cutting I had to do. I ran into a road block at that point, because on the right hand side, I had a very small gap between the tile and the wall. I was impossible for me to cut tiles that narrow, so I decided to embrace the gap and make the left hand side match so that it would look intentional. I knew I the tile needed to go across the whole width of the counter top, so after some brainstorming, I decided to make both the top and the bottom parts wider than the sides. And I am so happy that I like the way it turned out! Here is a picture of the sink before we changed it, and shortly after we moved in. It wasn’t horrible, just basic and outdated. The newly made over vanity with the subway tile is so much better! It’s kind of like this out of style vanity grew up, developed a sense of style, and became a hipster! 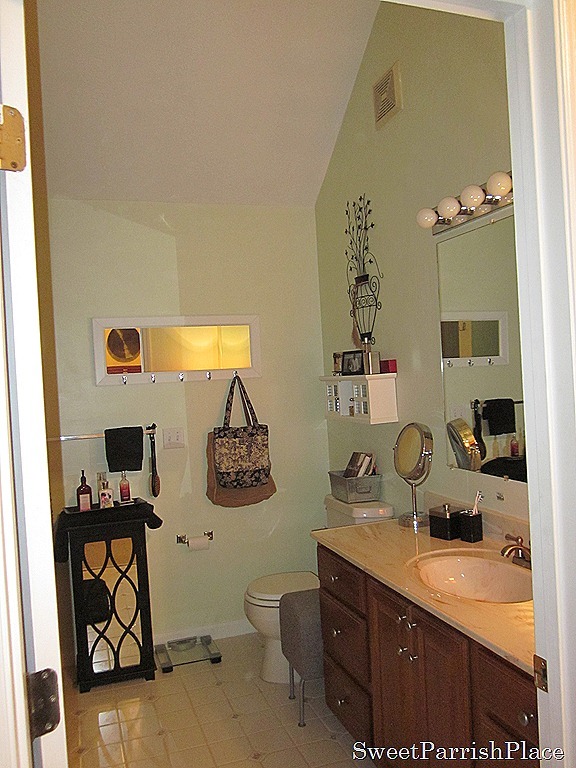 Here is a shot of the same view after we painted the vanity and before we painted the walls, changed out the light. or hung the tile. I had always planned that I would frame out the mirror, but now that the tile is finished, I feel like it almost looks like a frame in itself, so I don’t think I am going to frame it at this point. I made the hand towel rack from a frame and a hook that I purchased separately. You can read the details on how I made it by clicking here. I love the way it looks even more with the subway tile! We replaced the recessed light over our bathtub with the hanging pendant light you see in the reflection of the mirror. It is one of my favorite things in the room, and gives the space so much more character than the old recessed light. And I am still loving the grey crates that I found at HomeGoods and used as shelves. 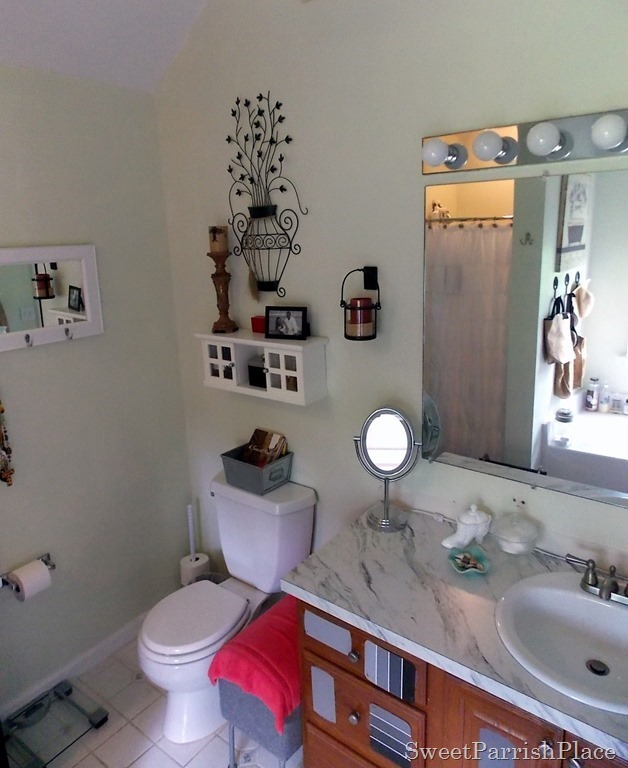 I am so much happier using this bathroom that we have made our own every day. Being in this room now, I feel at home. And I can’t be more happy with how it turned out! Here is another shot that was taken after we finished the vanity and before we painted the room. Can you notice the greenish cast the color of the room gives to everything? That is completely gone now, and I feel like I have a neutral pallet that will be easy for me to change up the color of the decor if I want to, just with a few accessories. I have not caulked where the tile and the counter top meet yet, but I plan on using white caulk for that. 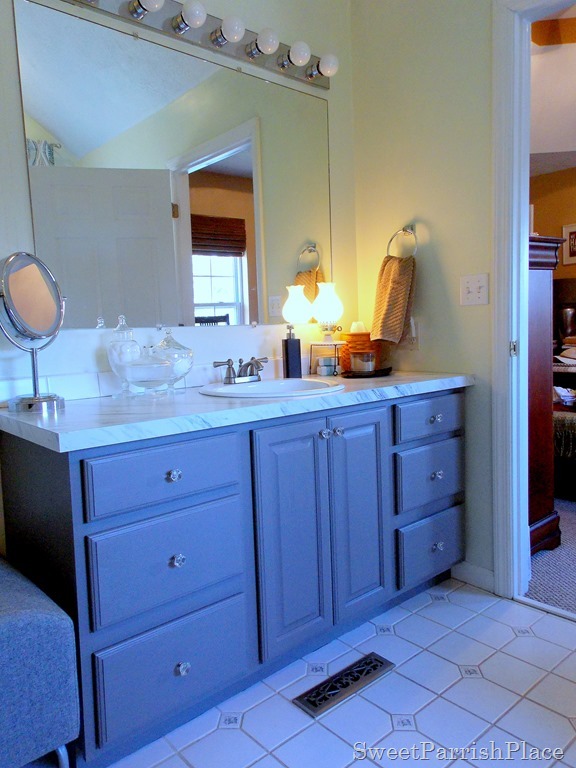 Here is one before picture that I took when I was choosing a paint color for the vanity. And here is the same view now. I found the giant heart at Hobby Lobby in the Fall, and it was the perfect addition to the room. I don’t plan on hanging anything else on this wall because the heart is just the right touch! feel like the room is so much more light, bright, airy now. It’s like a breath of fresh air to me! And even though LC sometimes grumbles about having to help me with the difficult stuff, like the lighting, he loves the way it is progressing too. And that is where we are with our bathroom right now! I have two more projects to complete this room. I plan to install the same subway tile around the top of the bathtub, and I think that will really help to pull the room together. And then I plan to paint the black cabinet white. I am also going to make over the blue tray that sits on top of the cabinet. I have been intending to do that since it was given to me by a friend and I decided to save that for last, because I can’t decided what I want to do with it. What do you think of our new DIY subway tile backsplash? I would love to know your thoughts, so please comment away! I love your comments and I read every one! Hope you are having a great Monday! And I have to say, I am so darn happy to have finally finished writing this post for the second time. I hope you enjoyed it!